Everyone knows how sliding doors work and most people know how bi folds are operated but what about the latest technology – a maximised opening using the Slide and Pivot system? The animated video demonstration from SunSeeker Doors illustrates where the access areas can be sited within the glass “wall” for your convenience. It is vitally importand to consider this aspect before placing your order. If the main door is situated on the far left, it opens to the left (inwards or outwards). Similarly, if you prefer to have the main access on the right, it will open to the right. Once the main door is open, access into the garden or conservatory can be anywhere along the width of the opening, by sliding any or all of the other glass panels along the guides. Note that all other doors will pivot open in the same way as the main one, but only when they are positioned next to it so that they all stack together at the edge of the aperture. UltraSlim perfectly complements Sightline doors. For internal use, the Frameless Glass doors are great room dividers and also ideal as enclosures to keep the cold wind at bay. UltraSlim and Sightline aluminium frames are only millimetres wide yet incredibly strong and resiliant. 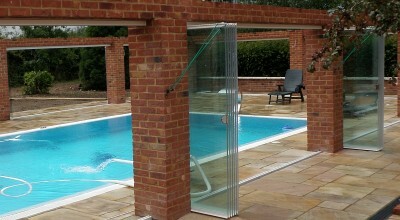 The glass can easily glide along the guides with minimum human effort. Find out more – contact us.